Continuous Band Sealer offeredis available under model options of KEPL 900L and KEPL 900V and require voltage (V/Hz) inputs of 220/50. These systems come with sealing Speed (m/min) of 0~12 (0~16) and 0~12 (0~16) and sealing width (mm) capabilities of 8~10 and 8~10. These are suitable for applications where fast, secure packing sealing is required and work as versatile sealing machines for heat sealable virgin and laminated pouches. Further, these allow sealing of different prefilled flexible bag varieties in a continuous cycle and finds usage suitability in industries like engineering and industrial items, food packaging, chemicals packaging. 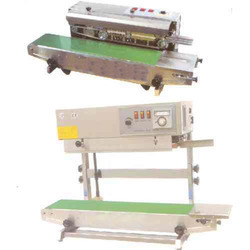 Heavy Duty Continuous Band Sealer offered comes in model options of SPCS 900AF (Air Flushing) and SPCS 900V with voltage (V/Hz) support required of 220/50. These systems are capable of delivering sealing speeds (m/min) of 0~12 (0~16) and 0~10 with sealing width (mm) capacity of 8~10. Further, the system also comes with speed adjusting transmission mechanism and electronic constant temperature control system that allows better operator control. Being suitable for handling plastic films of different materials like PE, PP, aluminum foils and others, it allows sealing of different varieties of pre filled flexible bags in a continuous working cycle. 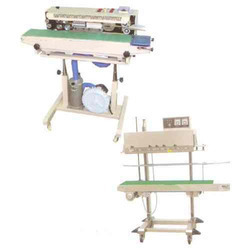 Looking for Continuous Band Sealer ?